My week-long 'vacation' is almost here, and my nails are happy because I'll finally have time to pamper them again. I've been wearing the same colors for the past months, huhu. 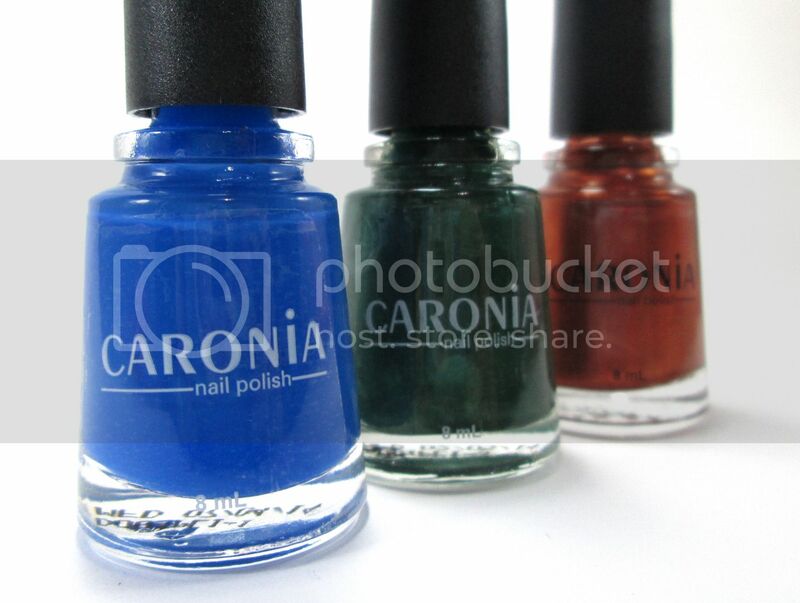 Anyway, I was going through my stash the other day and remembered I had these polishes from Caronia's Blue Moon collection that was released a few months ago. 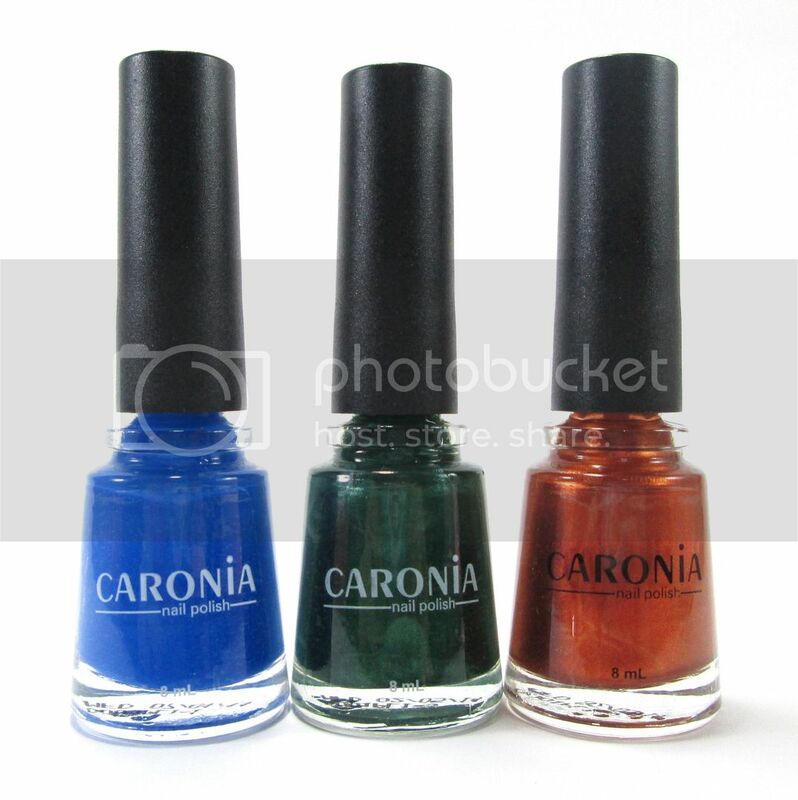 Caronia, in partnership with Ballet Philippines, came out with the Blue Moon collection, a set of three bold colors that are sure to make remarkable occasions even more glamorous. And bold these colors are, indeed! Let me show you. I used two coats for the following swatches. This is my fave from the collection. I love the color a lot. Well, I love blue on my nails, so that's a given! The formula is alright as well. This is the only solid color from the set, as you may have noticed. It's easy to apply and fully opaque after my default two coats. One of the two frosted colors in the set. 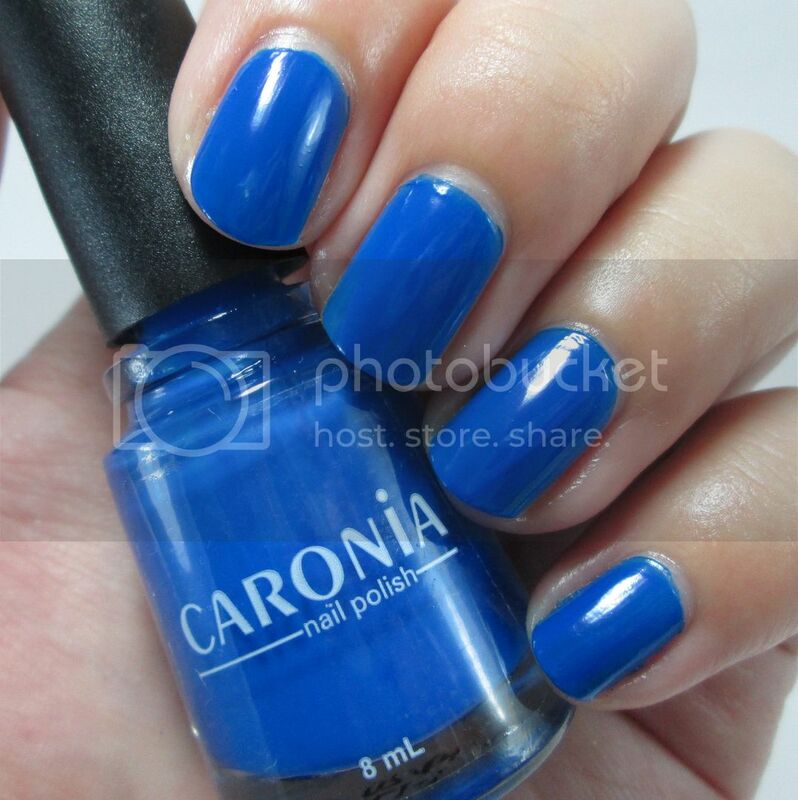 It applies ok, not too streaky like some of Caronia's Frosted shades. 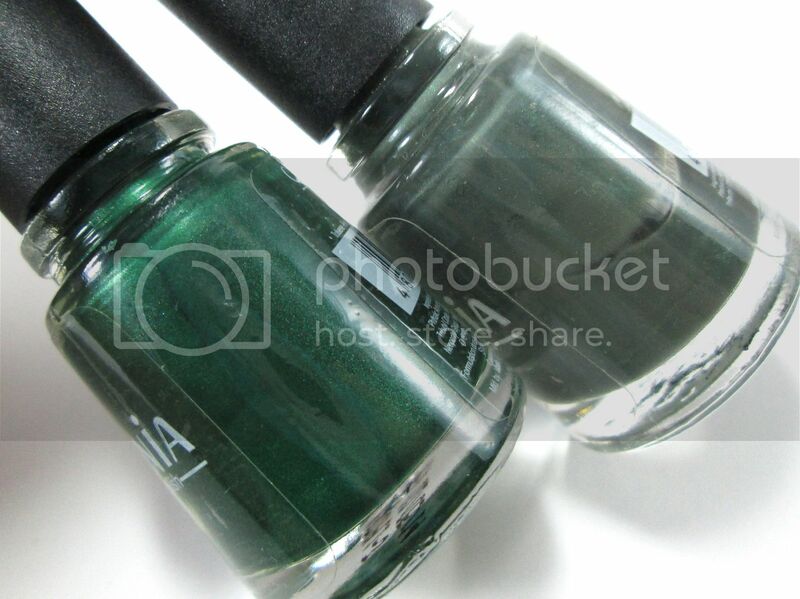 Plus, I think the metallic finish makes the color more emerald-y. This is a very holiday-ish shade, too. 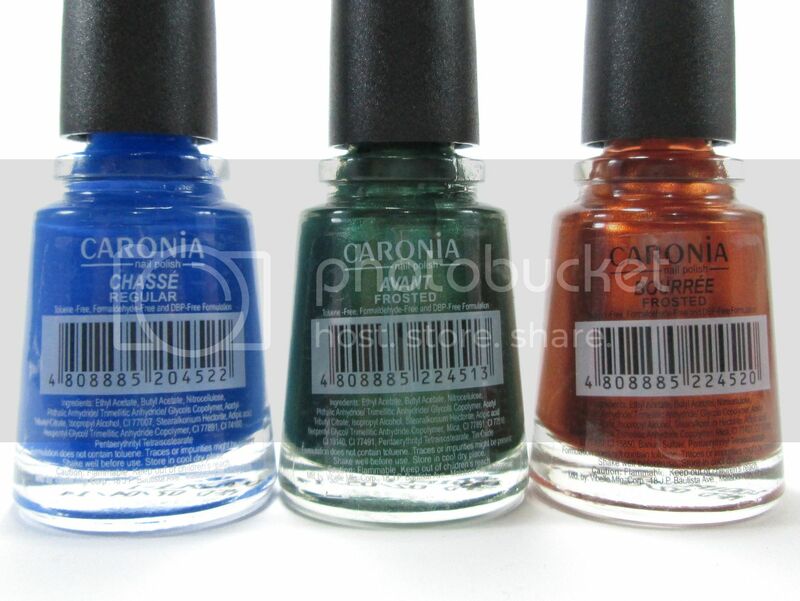 The first time I saw this, it reminded me so much of Moss from Caronia's Miss Mystic collection, but they're actually way different as you can see below. This is my least favorite in the bunch. 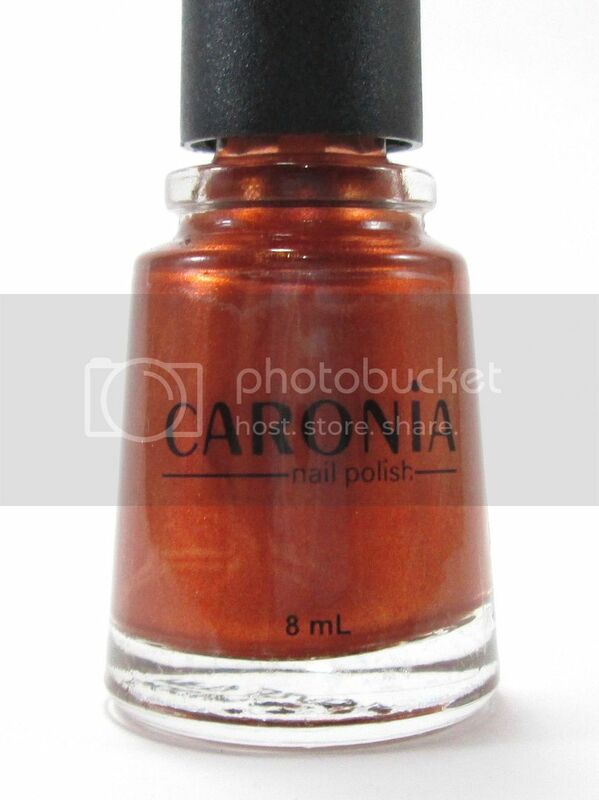 It has more of an orange tone than brown, IMO, and I don't really like orange on my nails (or anywhere else). The color just doesn't go well with my skin tone. And the frosted finish isn't helping. So far I've only found two orange shades that I like, and this isn't one of them. 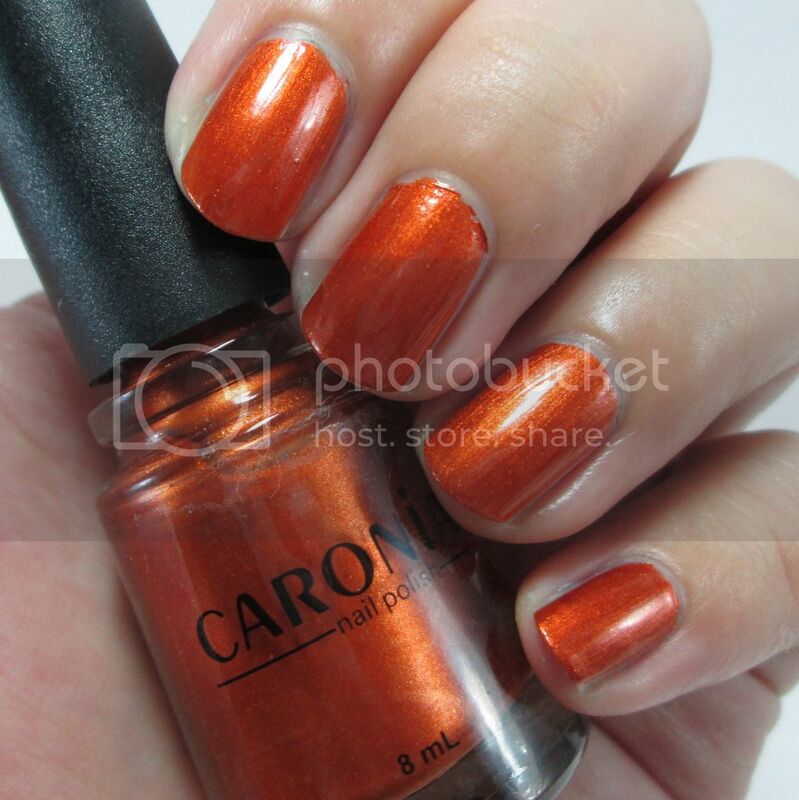 But I can do orange in combination with other colors and love it! I'll show you an example later. 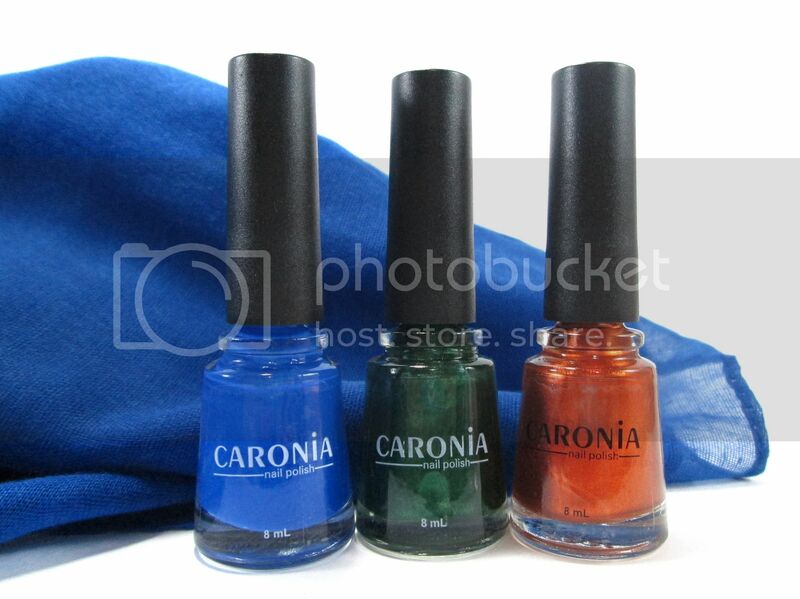 If you're craving for some color this Christmas, you may check out Caronia's Blue Moon collection. Available in leading supermarkets and department stores! The shades are indeed bold and fully opaque in 1-2 coats. Formula's not too bad as well although I find Chasse's the best among the three. 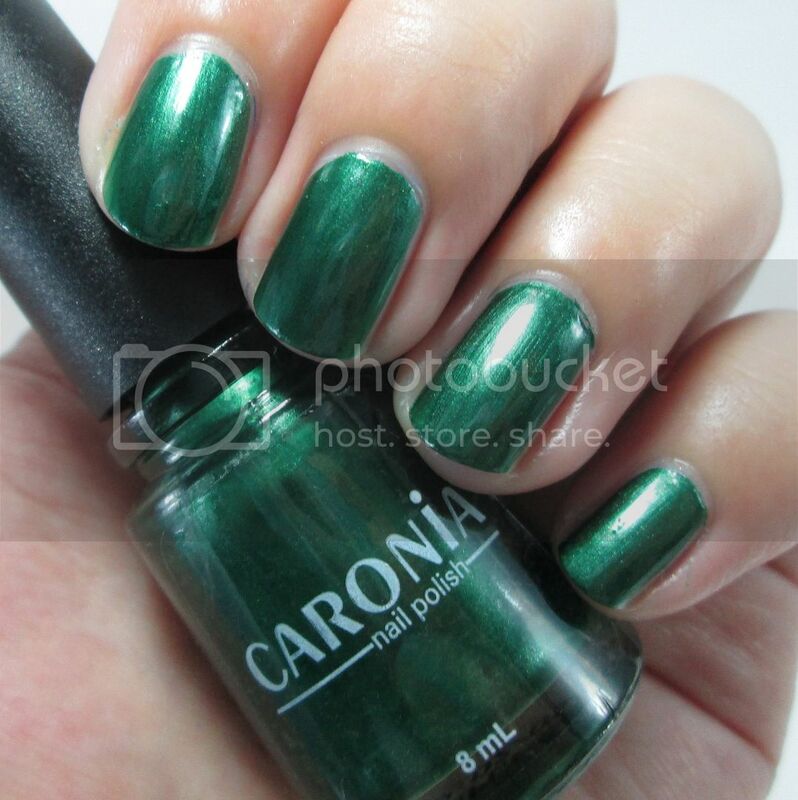 My thoughts on Caronia's formula vary on a case by case basis. Some of their regulars are good, some are not. Some of their frosteds are good, some are not. But for me their collection is mostly good, especially for the price. 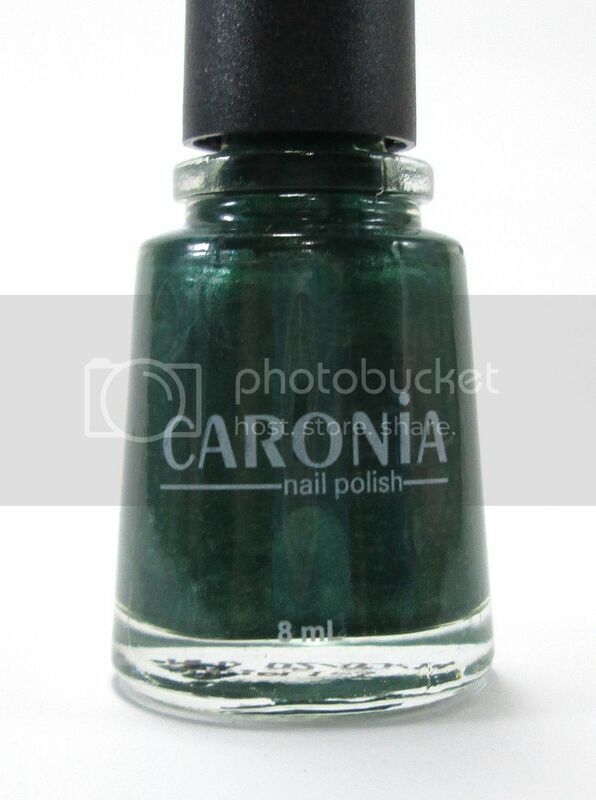 Caronia remains to be one of the least expensive but trusted nail polish brands in the Philippines. I do hope they work on their brushes, though. 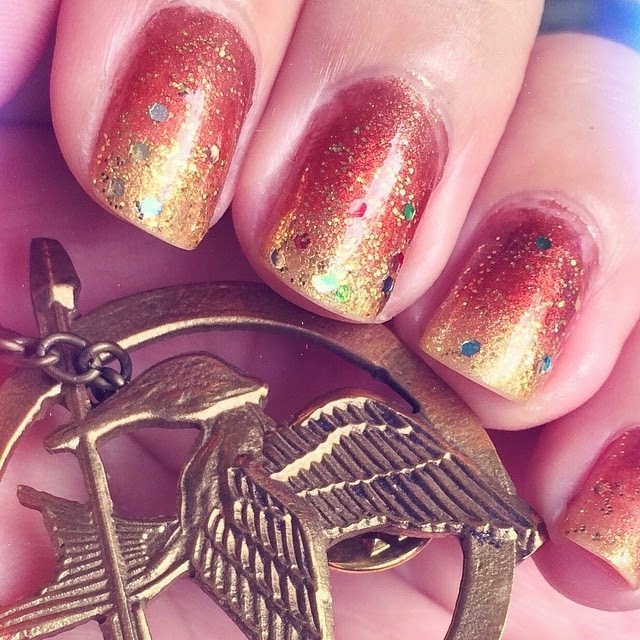 So as promised, here's a photo of my recent gradient nail art inspired by Mockingjay Part 1 and Lorde's Yellow Flicker Beat. 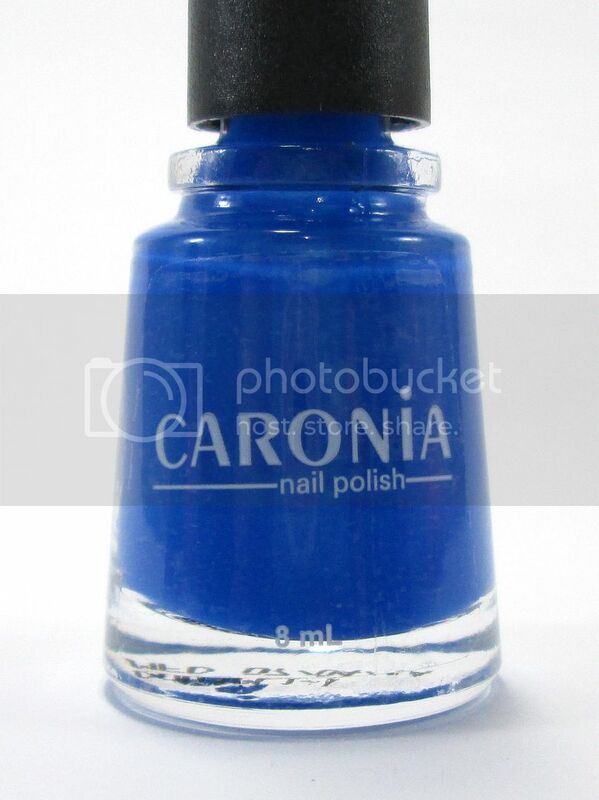 I used Caronia polishes for this, one of them being Bourree. And this is the red, orange, yellow flicker beat sparking up my heart!